In this issue of Publishing Perspectives Magazine, publishing leaders tell us how they see the book business today and tomorrow. Plus, read our special preview guide to the 2016 Frankfurt Book Fair. This issue includes news and market snapshots, leader insights, and more. Riding the wave of energy that comes with the fall season in book publishing, we asked leaders in the global book business for their insights. 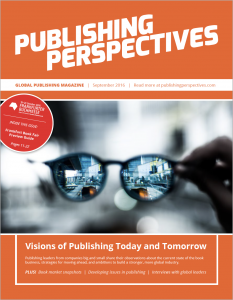 In this issue, CEOs and publishers tell us how they see the publishing industry today and how it might evolve in the future. We’ve also gathered snapshots of developing stories across the globe, as well as an exclusive Preview Guide to the 2016 Frankfurt Book Fair. “What’s heartening, however, as we’ve spoken to players in so many parts of the world, is a ready sense of response. ‘Neither our lists nor the platforms on which they are published can stand still,’ says Hachette UK CEO Tim Hely Hutchinson. “As if in answer, Abuja-based publisher Bibi Bakare-Yusuf at Cassava Republic talks of charging ahead with book sales on mobile devices: Nigeria is mobile. And Nigeria is reading. “In Barcelona, Grupo Planeta’s articulate digital director Santos Palazzi has become an advocate of better exploiting intellectual property, generating film and television deals from Planeta’s vast list, even in a recovering Spanish market that has lost as much as 40 percent of its sales. “From the insights of former Soviet publishers—in Russia, Ukraine, Belarus, Kazakhstan, Georgia, and Armenia—to the powerful messages of the seven pivotal regions to be spotlighted on October 18 in The Markets: Global Publishing Summit, what we hear this year is determination, creative concern, and real collegial response: we’re all in this together, our interviewees are telling us. Download our Fall 2016 Magazine to read more!